There's something about Miranda July, isn't there? amen to the computer being a distraction! it is kinda hard when you work on it and play on it too! hahaha this is a quality idea. she's lovely. read her books?? I have never seen miranda july before! dang! that was deep! i guess i need to trap blogger right about now..
third one posting this today! What happens when your phone vibrates while you're out on a jog and your wedding dress gets soaked in cranberry juice? This makes me really nervous. I think now I'd just sit there distracted by the fact that if something were to bump the grape juice (me, my husband, the baby, or cat) it would be all over my white dress! I agree with Kasie.. I can just see my cats chasing each other and falling into the grape juice! 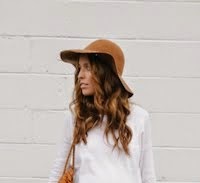 I'm new to your blog and followed right away, I'm totally in love with your style and congratulations on your pregnancy! Great video! Thanks for posting. I posted a video on my blog today that I absolutely love. love this video - thanks for sharing! i couldn't agree with it more. and maybe i need to do this too. and i hope her hostage doesn't get hurt. I know if I tried this I'd bump that table and stain the dress :(. I have never heard of her before. I love this idea. i wish I could trap all my distractions. So interesting, I've never seen or heard of her. I'm pretty sure that I should do this some days with my cell phone, and internet. I get so distracted! It's so.... weird in a cool way. Ok. This seriously almost gave me a panic attack! The cranberry juicy just seconds away from getting all over her gorgeous white dress!! AAAAAH!!! But seriously...I might have to try this. I have several Christmas quilt I'm trying to get finished before Christmas. I saw this on belubird, cracked me up! haha so funny, and so true. i love how she's so cautious and methodical, like if she's not careful the computer will grab her or something. i'd do this but my dining table is way too heavy! I can't help but cringe when the cranberry juice makes an appearance. Yikes! All the same, I can't help but fall in love with her and this idea. Cool! I got to meet her when I got an audition to be her double for a movie she was working on. My skin tone was a little off, but still way cool. this video is AWESOME. Great way to put things in to perspective. On a scale on 1 to 10, how ironic is it that I watched this video instead of grading my 7th graders' exams? What an awesome video! I love it. It really does make me want to trap my distracting items. Love that the tweezers are in the distraction category! there sure is! i simply love her her movies are adorable and she is too. Love her love her love her! I didn 't know this video! It is beautiful. thank's for shareing it with us! 2) Why did her skirt have a crotch piece? !